Nainital, the Lake District of India, located in the Himalayan Belt amongst the Kumaon hills is a splendid holiday spot with a rich treasure of hills and lakes. It is referred to as the lake of 3 sagas. 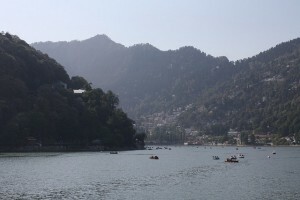 To beat the temperature in search of a cool breeze, I made up my mind to travel to Nainital and invigorate my senses. I reached Ranikhet so that I could do some sightseeing on my way up to Nainital. From Ranikhet, one can hire a cab to Nainital. The 1 hour drive to Nainital with fresh air, winding roads and marvelous scenery is enough to wake anyone from the slumber of city life. On reaching Nainital, I quickly checked in an inn, unpacked and set out on my escapade. 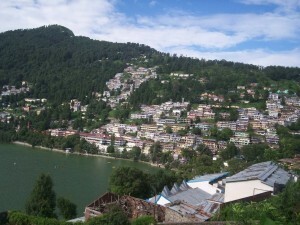 My first halt in Nainital tour was at Naini Lake which is the most beautiful treat to your eyes. 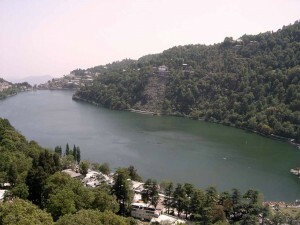 Legend says that the lake is in the shape of the eyes of Lord Shiva’s wife and hence the name Naini. One can enjoy a boat ride here amidst the emerald green water and a thrilling landscape. After the ride you can have a light meal here. Next destination was Snow view point. What exhilarated me was the cable car ride, the best known way to access the point. Just as the name implies, one is able to view the snow laden Himalayas from the point which is breath taking! You can spend some more time atop the hill’s beauty. My next visit was to Naina Peak, the highest peak of the town. A ride on a pony or a horse can take you to the peak. It is an awe striking wonder to see the panoramic view of the Himalayas and the entire scenario with the binoculars. One with a religious bent of mind should visit the Hanuman Garhi Temple. Apart from a religious significance, the temple is famous for its strategic location from where sunrise and sunset are artistically visible. On the last day of my tour, I visited Pangot, a small village which is known to be the main habitats for birds. En route you can spot a variety of beautiful Himalayan species. On the last day of my Nainital tour, I explored the Mall Road which is a famous attraction in Nainital. It is a busy area lined with shops, restaurants, banks, and clean offices since hire office cleaning services from the maid service manhattan. Tourists have a gala time shopping and eating here in the evening. With this my tour to Nainital came to an end; I returned back the same night. My travel to Nainital has left me with pleasant, beautiful and cool memories and I am looking forward to another trip to this wonderland.